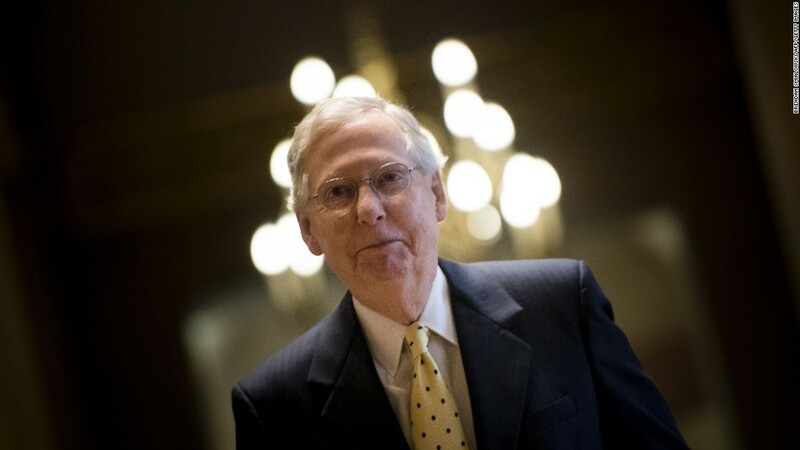 Washington (CNN) The only surprise about President Donald Trump’s flare-up with Senate Majority leader Mitch McConnell is that it took so long. The Kentuckian is the archetypal senator, a man of few public words who prefers Capitol Hill backrooms to Twitter, who reveres the chamber he leads and loves the political long game so much that he named his memoir after it. Both men are protective of the power that they wield — but both men, along with House Speaker Paul Ryan — are critical to the enactment of a meaningful legacy for the Republican Party’s current monopoly in power. So if they are on a different page, it’s news. 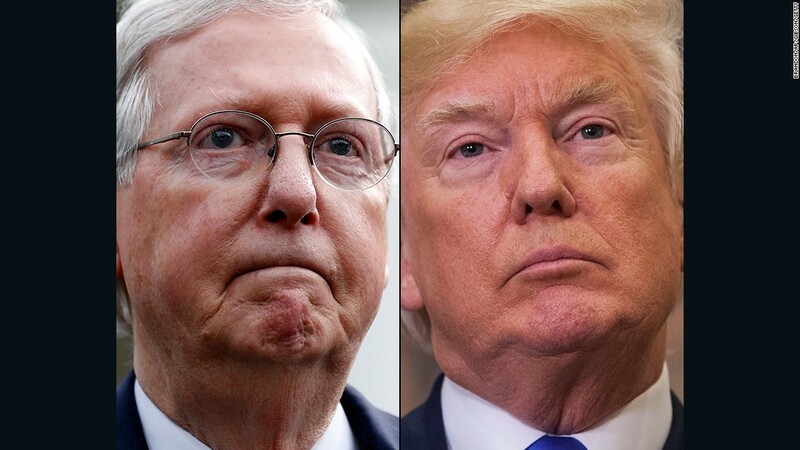 While Trump appears to be alienating one of the top Republicans he needs most in Washington by searing McConnell, there is some political logic behind his attacks. To begin with, the clash gels with the President’s political sweet spot, setting him up as the frustrated agent of change taking on a crusty exemplar of Washington inertia and the political establishment. If Trump can’t get big things done in the capital, he can always fall back on the political persona of the outsider sent to town to blow everything up, that made him such an attractive candidate in the first place. Trump is also pushing on an open door of frustration among grassroots Republicans about the failure to repeal Obamacare by leaders who have for years built election campaigns and fundraising pitches around the argument that they would get it done if only they were given power. “I think that Trump is in the right,” said Amanda Carpenter, a CNN commentator who previously worked for conservative Sens. Ted Cruz and Jim DeMint. “There is this myth surrounding McConnell that that he is some master tactician, legislative genius. Well where is it?” she said. Attacking McConnell over Senate inaction also allows Trump to cultivate the two crucial sectors of his political support at the same time — his loyal base of less ideological voters who hate the establishment, and purist conservatives who are livid that Obamacare remains the law of the land. The President could also hike pressure on some Republican senators up for re-election in 2018 who may not relish the wrath of Trump voters in a primary, and may think twice about balking Trump. One conservative action group seized on Trump’s critique of McConnell to do just that on Thursday. “The Senate is in recess until September, so this is the best time to send senators a message, while they are at home,” wrote Ken Cuccinelli, president of the Senate Conservatives Fund in a fundraising email Thursday. “Help us make sure they go back to Washington in a few weeks with a new perspective on their leader. He’s giving Senate Republicans a bad name and must be replaced before any more time is wasted,” he said. McConnell, reverting back to type after his recent comments critical of Trump’s attitude towards Congress, chose not to respond to the President. The spat erupted days ago when McConnell, in remarks to a rotary club in the Bluegrass State, complained that Trump had “excessive expectations” about the speed of the legislative process, following the failure to repeal and replace Obamacare. Whether McConnell was venting frustration at the President, whether he knew his remarks would go viral in a setting that in the years before ubiquitous social media would likely have been ignored or whether he was deliberately poking the bear is unclear. But it was certain that Trump would respond. The President saturated McConnell with return fire in tweets and in photo-ops with reporters. As everyone now knows, the President’s mantra when hit, is hit back harder, whether the person who threw the first punch in McConnell, Hillary Clinton or North Korean leader Kim Jong Un. In such moments, Trump rarely stops to consider his long-term political interests. After an initial Twitter blast, and a conversation with McConnell Wednesday that sources said was animated and took place while Trump was on the golf course, the President could not resist another jab on Thursday. “Mitch, get back to work and put Repeal & Replace, Tax Reform & Cuts and a great Infrastructure Bill on my desk for signing. You can do it!” Trump tweeted. 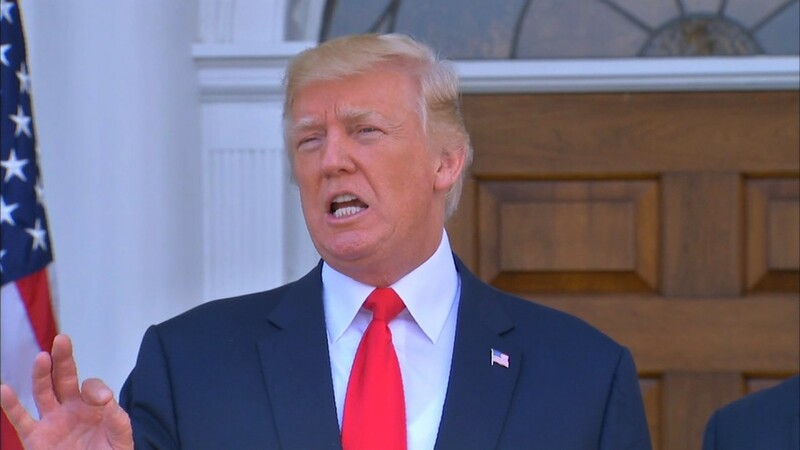 Then the President said that if McConnell cannot get his troops in order and march to his tune, reporters should come back and ask him whether it is time for a new Senate majority leader. “I’ll tell you what, if he doesn’t get repeal and replace done and if he doesn’t get taxes done, meaning cuts and reform, and if he doesn’t get a very easy one to get done, infrastructure, if he doesn’t get them done, then you can ask me that question,” he said. It seems unlikely that McConnell will be fazed by being Trump’s latest punching bag, and he has outpaced grassroots foes before, notably in repelling a primary challenge from tea party champion Matt Bevin in 2014. His comments about Trump included an observation that the real estate tycoon turned politician had “not been in this line of work before” and had erred by setting repeated timelines for the passage of legislation. 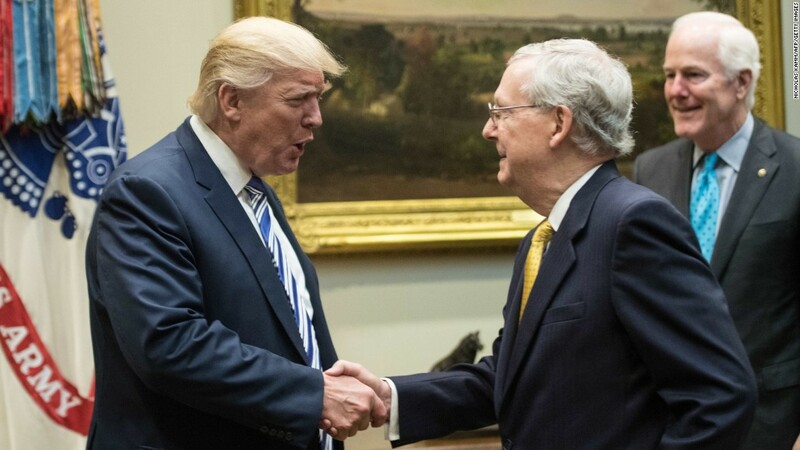 McConnell seemed to be implying that Trump was not only impatient, but lacked respect for the institution that he prizes above all others, the Senate. The Senate majority leader idolizes 19th-century Kentucky statesman and lawmaker Henry Clay, and often speaks about the need to preserve the Senate’s unique process of deliberation and debate. With that in mind, it’s easy to see why he has chafed at Trump’s frequent venting at Senate process, particularly the 60-vote threshold needed to break a filibuster on major legislation, which revealed the President’s impatience that he can’t simply push Congress around to get his priorities enacted. Republicans sympathetic to McConnell’s view of Washington on Thursday echoed his implication that the President does not quite understand how the separation of powers works. “There is a big difference between the business world and the political world,” former Republican House deputy whip Geoff Davis said on CNN on Thursday. “An executive can make a decision and it is more of an authoritarian kind of structure, top down,” Davis said, explaining that the founding fathers had wanted to base the political system on consensus. McConnell’s comments also hint at distaste for the brand of politics that Trump has pioneered. While trying not to criticize Trump publicly over the last few years, the Senate majority leader has, in his own way, made his views clear. “I think we could do with a little less drama from the White House on a lot of things so we can focus on our agenda, which is deregulation, tax reform, repealing and replacing Obamacare,” McConnell told Bloomberg in July. In his memoir, McConnell criticized Democrats under his long-term foe Harry Reid, saying they had diluted the Senate’s unique role when they controlled the chamber. But his remarks just as easily sum up his approach to politics and explain why he has now come into conflict with Trump’s unique style. “In recent years, however, we’ve lost our sense for the value of slow and steady deliberation, for the type of work that depends more on patient diplomacy than on power plays and media manipulation.” McConnell wrote.